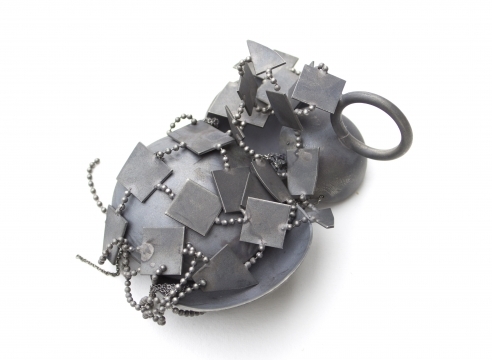 Soft, 2015, Wool, Nickel, Silver, White Gold, 1.18 x 1.57 x .1 inches. Campaign 2, 2015, White Gold, Army Blanket wool, Nickel Silver, 3.94 x 1.18 x .39 inches. Tiny, 2016, Leather, Nickel, Silver, 1.18 x 1.18 x 1.28 inches. but these recollections will do. Visitors to Ornamentum will remember Aaron Decker as our intern two summers ago. With an MFA degree and several awards under his belt since then, Decker has put together a body of work made recalling childhood scribblings of toys and weapons, violence is naively disguised as playful. Oddly cartoonish compositions of military badges, stuffed toys and silver scribblings come together in Aaron Patrick Deckers first solo exhibition. Enlarged pinbacks, upholstered bodies, and rhinestone gestures reveal these objects' insecurities - camouflage both formally and conceptually. While silver badges riddled with engraved stars, squares and triangles formed from a naïve sensibility offer a peek into his first solo exhibition Derby and His Badges.